When an arrogant management demanded attendance-policy changes that would make it easy to fire half of their co-workers, the UE Local 155 negotiating committee at Generation Lighting held firm. Their new three-year contract, ratified in November, instead removes some of the most onerous aspects of the previous attendance policy, and resets all employees’ attendance-policy “points” to zero. “Missed punches” will no longer count as attendance-policy occurrences, and workers are now allowed to use up to two days of their paid time off in four-hour increments. UE members gained an additional day of paid time off, and the second break of the day was increased from 10 to 15 minutes. New hires will now receive forty hours of paid time off per year to comply with a new New Jersey law mandating paid sick time for all workers. The contract includes wage increases of three percent in the first year and 2.5 percent in the second and third years. The 401(k) plan was changed so the employer will now match higher employee contributions with a one hundred percent match for the first two percent and a fifty percent match up to six percent (the employer match was previously capped at three percent). When workers are temporarily assigned to a job with a higher rate of pay, they will now receive the higher rate immediately. This closes a loophole in which the company was able to evade paying higher rates by shifting workers to a higher-grade jobs for less than two hours. Although the employer wanted significant increases to workers’ health insurance premium contributions the UE committee was able to keep the increases minimal. The UE committee kept the membership united and informed through constant communication by phone and text, supplemented by worksite meetings. Members in the shop used their machine horns to let management know they wanted a fair contract, honking their machine horns every hour on the hour, and laying on the horns anytime a manager walked by. They also held a “black t-shirt day” to demonstrate unity. “The prior contract we had was decent at best, but with the new contract we got a lot of improvements,” said Chief Steward Kiwan Small. “Clearing the attendance occurrences to zero was really helpful to the union members on the cusp of termination. They got a clean slate. The three-percent raises in the first two years are great — people really deserve that money. “Bargaining is stressful, but at the end it’s worth it. You have to stay firm in what you believe in. Don't let the management team bully you into getting what they want. Be strong. Go in with the confidence that you can get all the things you're seeking. Generation Lighting is a warehouse for lighting equipment. 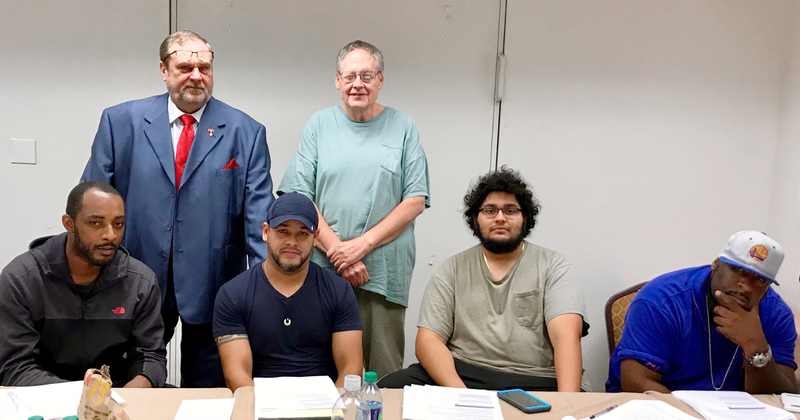 The negotiating committee consisted of Local 155 President Henry Diaz-Lopez, Chief Stewards Tito Cruz and Kiwan Small, Local 155 Trustee Ray Yonskie, and stewards Frank Kasperowicz and Craig Brown. They were assisted by Field Organizer Tara McCauley. Negotiating committee member Ray Yonskie made a point of wearing a suit to every bargaining session, and before most of the sessions he wrote a quote for management on the whiteboard in the meeting room that negotiations took place in.